Elizabeth Wenk’s JMT trail guide has long been considered the best, and the new edition is even better! Hiking the John Muir Trail is a far more contemplative exercise than one might guess. Sure, it’s important to get the right shelter, sleep system, and water purification strategy, but the vast majority of your waking hours will not be spent in a tent or filtering water — they will be spent experiencing all that is the Sierra Nevada, from Yosemite Valley to the top of Mount Whitney. Hiking, like life itself, has its own hierarchy of needs. The higher you go up the pyramid, the happier you’ll be. Water, food, and shelter may be necessary while you are out there, but they are far from sufficient. 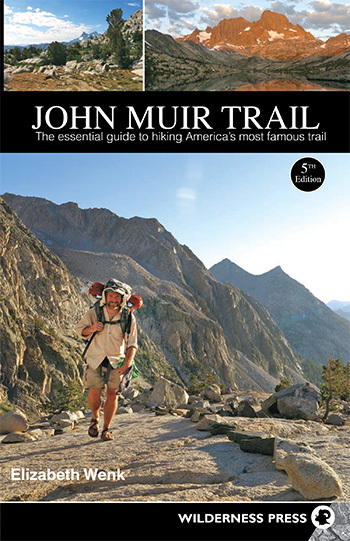 The very best way to get the most out of your experience in the wilderness is to understand it, and there is no better way to do that than to carry along Elizabeth Wenk’s John Muir Trail: The essential guide to hiking America’s most famous trail. The fifth edition was released just a couple of years ago and — to use a software analogy — it’s a major upgrade. The meat of the guide is still the trail descriptions, divided into thirteen sections. In each section there is a map; a profile illustration; a table with principal locations specified by elevation, distances, and UTM coordinates; sidebars with special information pertaining to that stretch; photos; and, of course, the textual accounts of what you will encounter on that portion of the hike. Another improvement over the last edition is that it is a bit smaller. Previous editions had separate sections for southbound and northbound hikers, but the fifth edition assumes you are hiking south. As a bibliophile, I cringe at the thought of how many fourth editions were mauled by JMTers who ripped out the offending section in an effort to lighten their load. One last point pertaining to this part of the book: included are photographs taken from the top of each of the major mountain passes, with the peaks labeled. This is a wonderful feature, sure to be used during your well-deserved break at the top. A fourteenth bonus section in the book covers side trips to peaks and other scenic points. I’ve rarely ventured far from the main trail, but perusing this chapter has made me re-think that approach. During my next hike I intend to try a few of these trips. Ms. Wenk’s description of Tawny Point, on the Bighorn Plateau, is especially enticing. Before and after the sections of trail descriptions are some real gems. The book opens with chapters on planning your hike, on staying safe and legal on the trail, and on Sierra Nevada history. At the end are appendices describing adjacent trails and the towns they lead to, as well as a comprehensive list of campsite locations (invaluable! ), locations of food-storage boxes, and a table of plant names (common, scientific, and family) referred to in the text. There is also a stripped down version of this guide—a “data book,” which includes just the maps, profiles, tables of information, and other critical information. If you are truly an expert in all things Sierra Nevada, that might be a good choice. Otherwise, my recommendation is to carry the whole guide. If you want to make your hike as memorable as possible, don’t just walk the trail, know the trail. Ms. Wenk’s book is the best way to do just that. Your comment is deeply appreciated, Steve. Thanks so much. Copyright © 2019 Strawberry Lake Press, LLC.